Here in Frogtown you will see quite a few different train styles. My favorite is the Spectrum Southern Pacific "Black Widow" but I also like the red "War bonnet" over silver, Santa Fe. 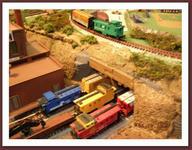 There is the green Seaboard life-like FA & FB, an old Pennsy and a solid red Canadian Pacific FA. 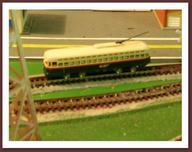 Pulling the long passenger cars is a red Florida East N-E7 A&B unit from Life-Like. 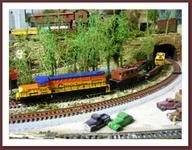 There are 3 Dash diesels, One Mp15 diesel Switcher, two Bachmann trolleys (1 Yellow & 1 Green/white PTC). There are 3 steam locomotives seen at different times. The smallest is a 4-4-0 Jupiter with tender that sits in the museum, a Life-like 0-6-0 Saddle tank switcher that works the warehouse yard and the big boy Mallard 2-8-8-2 that rolls thru once in a while. Most are vintage Atlas (Meaning They are Old but Run) or Lifelike.